Since 1997 Crane Hot Line has been North America’s primary source for the crane, rigging, and specialized transport Industry. 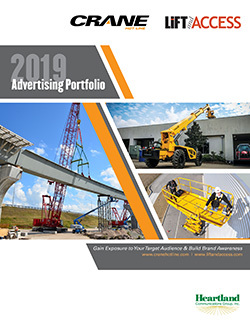 Crane Hot Line’s print and digital editions are read monthly by heavy equipment contractors, crane-rental companies, riggers, specialized transport/heavy haulers, equipment dealers, and affiliated companies involved in the lifting and specialized transport industries. Crane Hot Line is also distributed at the industry’s key tradeshows and association conferences. The print edition’s monthly readership includes members of the Specialized Carriers & Rigging Association (SC&RA), the Crane Rental Association of Canada (CRAC), and the Association of Crane & Rigging Professionals (ACRP). Those associations represent a large portion of crane, rigging, and heavy haul companies in North America that rent and purchase heavy equipment and support products. Crane Hot Line’s monthly digital circulation – 20,000 to USA, Canada, and others. Crane Hot Line’s editorial covers a broad mix of topics and delivers information and insight about cranes, rigging, and specialized transport. Its articles cover vital topics that include new products, new technology, legislation, standards, equipment applications, business issues and tips, fleet management, equipment maintenance, key events, safety, training, dealer announcements, people news, tech tips, and industry issues. Crane Hot Line is published by Heartland Communications Group Inc., a media organization with a 50-year history in business-to business publishing. Heartland specializes in providing information for the construction, industrial, aviation, and agricultural markets.